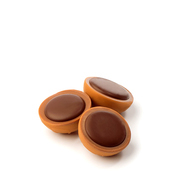 A delicious caramel cup filled with hazelnut, nougat cream and chocolate. Launched in Germany in 1973, it was the world's first confectionery of its kind. Today Toffifee is enjoyed in more than a hundred countries - there is something in Toffifee for everyone: a crunchy hazelnut in delicious caramel, with nougat cream and smooth dark chocolate on top. There is something in Toffifee for everyone: a delicious caramel cup filled with a crunchy hazelnut, nougat cream and topped with smooth dark chocolate. Launched in 1973 and now available in more than 100 countries: Toffifee is a real success story. The success story of Toffifee is on-going. In 2015, Toffifee was already available in more than 100 countries. Toffifee keeps on inspiring fans across the world through numerous Toffifee-based recipe ideas for cakes, muffins , or just simply enjoyed at it’s best: as is. Toffifee hit UK screens for the first time in 10 years with a new TV advert featuring the great tasting family treat. The TV advert communicates the unique product qualities of Toffifee that are loved and shared by the whole family and includes the tag “There’s so much fun in Toffifee”. Toffifee retains its relevance at the turn of the new century in Germany and abroad. Through its combination of four ingredients, Toffifee became an increasingly popular treat for the whole family. Loud, colourful and slightly crazy – those were the 1990s. But what about Toffifee ? Whilst all ages were out exploring the world, Toffifee always provided them with a reason to go back home to all together.